Toy makers love John Deere, that's why they officially license toys from one of the biggest and best manufacturers of agriculture and farm machinery in the world. 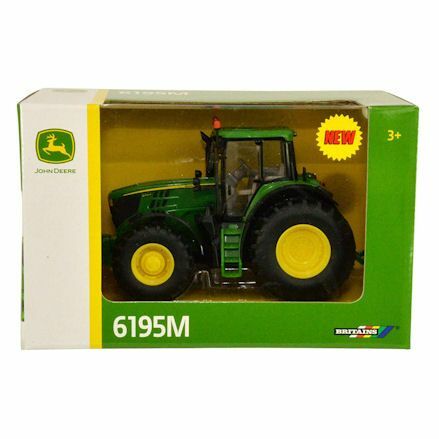 John Deere themselves are not responsible for the huge number of John Deere licensed products across many different toy ranges, but the individual toy makers who pursue and license toys under the John Deere brand are. Whenever you buy John Deere farm toys like a tractor, puzzle or a baby toy; a little bit of the profit may end up in big John's pocket. Not bad for a company whose only objective is the manufacture of the real life tractors, until of course the reputable toy manufacturers come knocking at his front door. This is all in an effort to make toys in the world renowned iconic green, black and yellow. There are up to - but not limited to - six main toy collection that John Deere toys are licensed under. Among them are the all time favourite die-cast John Deere toy tractors, with ride-on tractors, puzzles, key rings, R/C and baby toys. 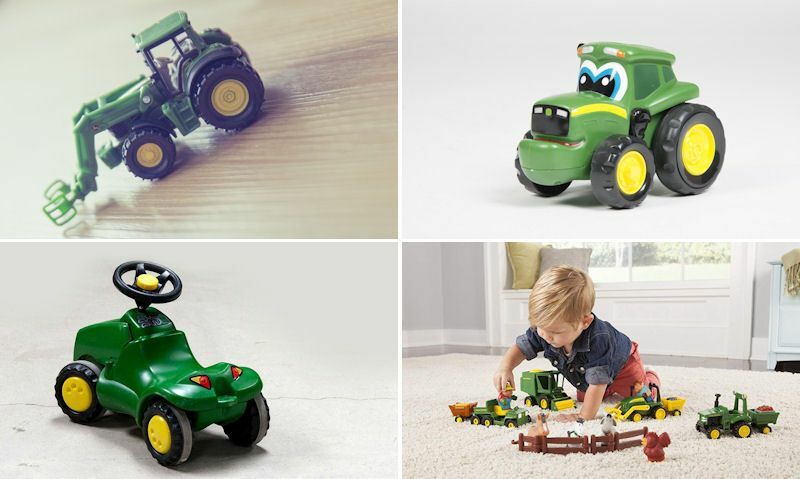 As a sole producer of farm machinery, John Deere farm toys are usually limited to a host of die-cast toy tractors based on their latest real life range in the series. Replica John Deere tractors are made in 1:87 to 1:32, to a large 1:16 scale from popular toy brands like Britains, Siku and Bruder farm vehicle collection. In Britains farm toys you have a huge selection of 1:32 scale John Deere toy tractors finished in green with yellow alloys and black trim, similar to the Siku Farmer Series. Except, Siku produce John Deere tractors in a miniature 1:87 scale, and with Bruder, they make large John Deere tractors and vehicles. Be sure to stick to the toy brands you know, you run the risk of buying a model tractor meant for admiring with collectors - and not a toy for child's play. The most extensive series of kids ride-on tractors are licensed under the John Deere brand - and boy ain't it a big one too. Unlimited designs await you, and you'll be spoilt for choice when it comes to picking a suitable one, so our ride on pedal tractor guide should come in handy right now. Ride on pedal-powered John Deere tractors take the spot light, followed with sit and scoot tractors for toddlers, with battery powered tractors coming in last. They can be standalone John Deere tractors and but ones with front loaders and trailers are preferable, if you could stretch your budget a little further. Next up in the John Deere franchise introduces a huge selection of John Deere puzzles baring the John Deere branding with green and yellow boxes. As usual you can expect puzzles and games involving around a series of current and past tractors, with additional farm implements added to the puzzle or game. Jigsaw puzzles range from 40 to a massive 200 jigsaw pieces for adults. 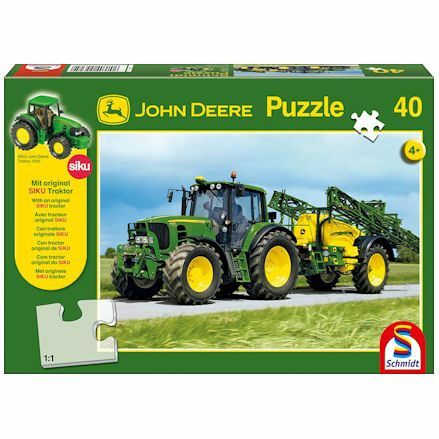 Among the number of puzzle makers who currently license John Deere are the biggest producer in Schmidt, who make puzzles in tins and in boxes based on all age ranges. Kids tractor and farm jigsaw puzzles make useful gift ideas for tractor mad fans so John Deere will make a hugely appealing present. Moving in to gifts and gadgets for children and adults alike you have a choice of green gifts in the shape of John Deere branded merchandise. 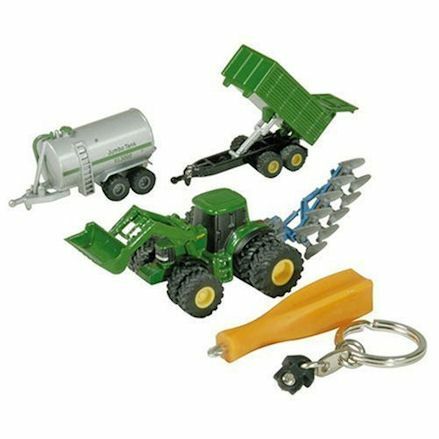 Most notably is the Bruder John Deere key rings perfect for use as a key ring and as a stand-alone little Bruder toy tractor simply by removing the key ring gizmo. On to more unusual, but ideal John Deere gift ideas you'll come across items for boys such as mugs and cups which are also ideal for dad but so are John Deere belt buckle and tractor theme cufflinks. This collection of John Deere products are fully licensed merchandise that may need verifying to confirm it's the real deal and not knock-offs or fakes. Radio control, or R/C as they are referred to are electronic replica toy tractors powered by batteries, with realistic maneuvering made by the hand-held control. And like any remote control tractor, John Deere ones still feature moving forward and backwards, turning left and right - with lights and sounds. Radio control tractors do all the things as the real life machine can do complete with sounds. 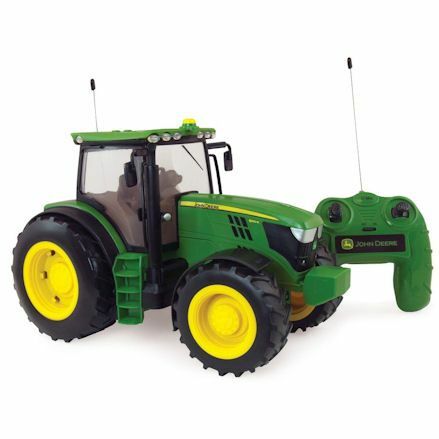 Top makers of John Deere radio control tractors include Britains Big Farm in 1:16 scale and compatible with Britains tractors and implements in the Big Farm range. Likewise, you'll find Siku 1:32 scale radio control tractors that fit well with Siku tractors. However, you can buy r/c trailers that feature lights and sounds. Unusually, John Deere's range stretches all the way to baby products covering educational and teething items. First up you have Britains chunky plastic toy tractors suitable for 24 months and above, although adult supervision may be required for preventing chewing. Apart from John Deere toys, you'll also notice John Deere baby products ranging from plastic teething toys and baby rattles with shape sorters also available. On baby clothing you have John Deere baby bibs and warm fleece blankets. 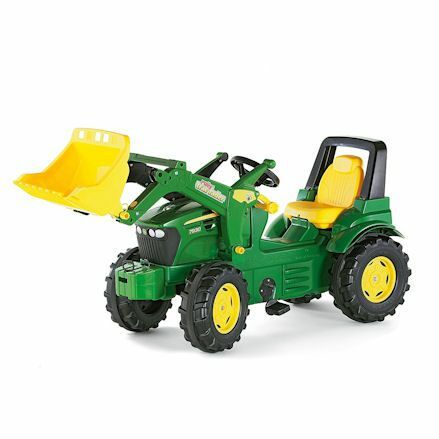 Overall, the design with John Deere baby toys is obvious from the chunky, rounded off corners and childish look and feel.